Gigabyte M704 is here. Suprisingly good first impressions. I remember how I raved about the Gigabyte U60 and Medion UMPCs. The spec appeared to be spot-on. Slider keyboard. 6.5″ screen, good size, 3hr battery life, real mouse pointer and a docking station. When it came to hands-on however, something was missing. The price, at 1000 Euro, just didn’t match the build and experience and along with many others, I was left a bit disappointed. Fast forward to the refresh, the Gigabyte M704, and things are different. The 7″ LED backlit 1024×600 screen is top-notch, the bump up to 1.2ghz on the VIA C7 has a very noticeable effect, the webcam is much better and the mouse controls are much more usable. Best of all, the price has dropped down to 760 Euros and, if you’re quick to order from Mobilx (aff. ), includes a free docking station. As I sit here in the garden writing this on the M704 i’m wondering if its a better option for me than the Q1 Ultra. Keyboard, real mouse pointer, a real docking station and a better price is going to make many others think about this too. I’ve got a three part unboxing and presentation video cooking in Movie Maker right now which will be uploaded later video available now and I’ll get a full review out later next week but in the meantime, check out my ongoing testing notes in the forum (feel free to ask questions) and check out the first set of photos in the gallery. Full specs in the database. Many thanks to Mobilx (aff.) who sent the M704 over and are now able to ship the M704 globally, with the free docking station if you’re quick. Post written on the M704 – Keyboard isnt bad at all! i’ve been using it for the past week amd i coundnt be happier.i am typing this with the m704 keyboard too. Any idea when this might be available in the U.S.? If not foreseeable U.S. release, recommendations on best way to buy? How good is the touch screen? Can old strategy games (like Command and Conquer Generals Zero Hour) be played on it…. using the touchscreen? havent tried any games on it, but i will say yes because with the hardware requirements, M704 can handle it. yes the touch screen should work fine on it. How noisy is it. I remember reports that first U60 fan was making a lot of noise. There are no fan settings, The noise is not annoying, you will only hear the air wooooshhhh from the top, unlike the grinding fan noise from most UMPCs(wibrain). Its much more quieter than wibrain(when wibrain is in cool mode). how heavy is it ? looks a bit thick too. This really seems like quite an exciting device! How do you feel it would handle documents through MS word. A lot of my current work requires specific attention to the minutiae of legal documentation. Do you feel that it is an advisable tool for that sort of work or that a larger device would be better? Thanks for your reply… but can you please play any games on it in your video review? Any game that looks decent…. Its a bit thick, yes. About 5mm thicker than Q1U. Performance wise it will be able to handle Office 2003 without problems. As for games, I havent yet done any tests. Actually, if Somes peoples are intestered by this machine or any others UMPC. we can make a group order and we can try to arrange to price (depend of the quantity of order). I wonder what will you say eventually about the value of a pocketable MID size (4.8″) compared to the feature richness of this umpc. Im really enjoying this device. Everything is working well. My only major problem is the weight. 750gm is light but for the places i use it (bed, sofa, chair) it needs to be 500gm or less. I just saw the video review and fell in love with the device. A question though: How good is the Handwriting recognition? Does it compare to Vista’s? Also note that the device has a soft touch screen which makes handwriting difficult. anyway, the device runs much better than with Vista. My friend owns the same device but from RoverPC (Russia) and it comes with Vista Starter which is useless. I installed XP Tablet Edition which works good. I wonder how it will work with UME, need to test it. Please tell us if you’re going to test UME to see how it works with that screen. ..by the way…no keyboard backlight! and did you have any issues with the docking station? if you do NOT connect the power to the docking station, the ports won’t work. So you need to connect the power cord to the docking station to be able to use USB ports etc. Yup. No keyboard backlight. Thats a big minus point. I have connected power to the station but the ethernet port is still not showing up. UME wont work on this device. I am testing it on the q1 ultra though. This is very disappointing. It seemed SO fluid when you were touch-navigating it. Watching the video I was almost 100% sure this is my-UMPC-to-be…. 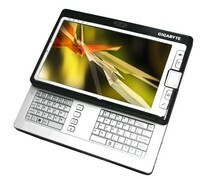 Any news of the gigabyte M700 ? seems far much better for me. Yup, worked that one out earlier today. Everything on the docking station working fine now. Thanks for the tip. Have been using the m704 exclusively all day and its working out well. I keep expecting to hit a major problem but apart from the things ive already mentioned in the forum, theres nothing to moan about. No news on M700 yet. Last i heard it would be 4th quarter. thx a lot i look forward the M528 too, hope they delayed it for cpu change..
My guess is that as soon as UME kicks in on its current designated devices, they will extend its processor base. “Can I run it on a Nokia N770/N800/N810? I just need a solution for that handwriting issue. Steve/Chippy, do you think that this 704 could serve as a notebook replacement? how fast can you type on it? How come the M704 can handle the 6M datarate video while the U60 can’t? According to the SEPC, they both use VX700 chipset, so what’s the difference? This is the most confusing to me. Do you have any idea why? It’s a suprise to me too. I’m using the Nero video playback tools which might make some difference although i’m not aware that they use their own WMP codec. I’ll look further into this for you. I can type fast on the thumboard, faster than most thumboards but you won’t reach the speed or, more importantly , the comfort of a real keyboard if you need to type a lot of text. It’s not a notebook replacement but could be a good replacement for something like an Eee 701. Is it typical that there’s no ethernet connection in the body – only in the docking station? Personally I like it this way round but I know many others, especially in offices, need that ethernet connection. A cheap USB adaptor can solve the problem though.